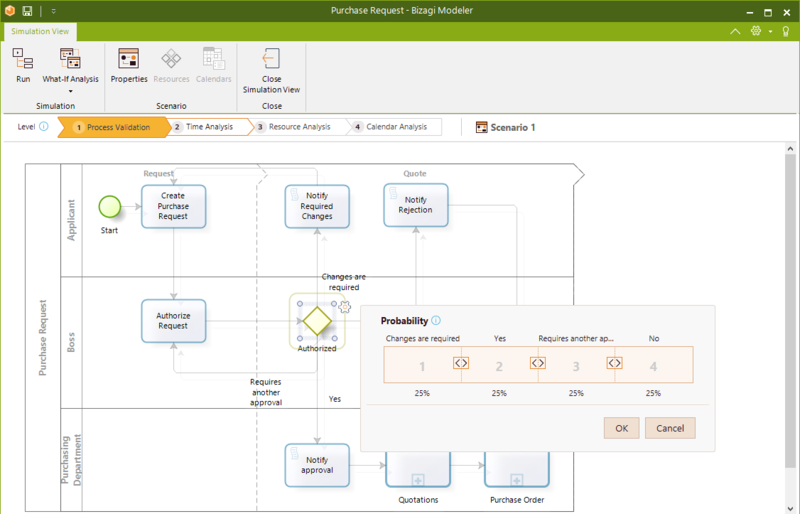 Bizagi allows simulation your business processes under the BPSim (Business Process Simulation) to support decision making and boost their continuous improvement. 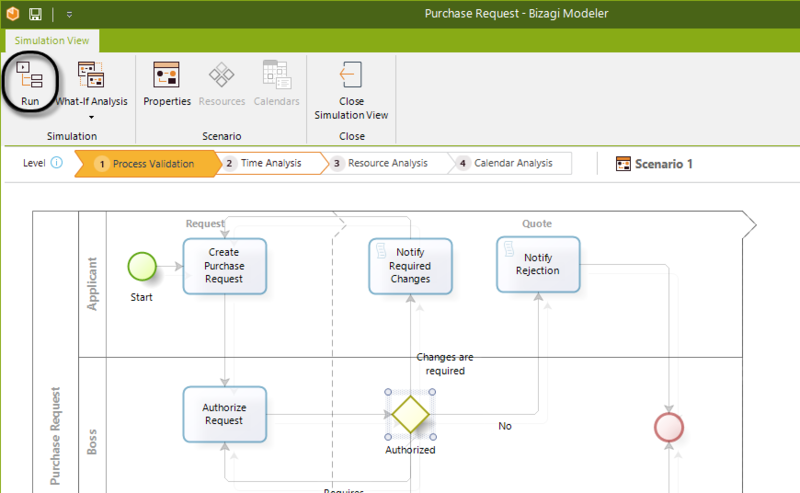 To start using simulation in Bizagi all you need is a complete Process model. otherwise, it will not be able to be simulated. Each subsequent level incorporates additional information that adds more complexity, providing a coherent analysis of your processes. Levels are not interdependent, you may start at any level if you hold the required process data . By default the Simulation mode will start at Level one, the first time a Simulation is run for the process model. It is best practice to start simulation at level one, and progress one level at a time. However. it is possible to move between levels at any time. Certain options will be available in the context menu of the ribbon according to the level selected. For more information about these options, please refer to examples for each level. •Collect process data for the simulation. •Add the data to the relevant shapes in the diagram. •Interpret and present the outcomes. How to create and run simulation models? 1. 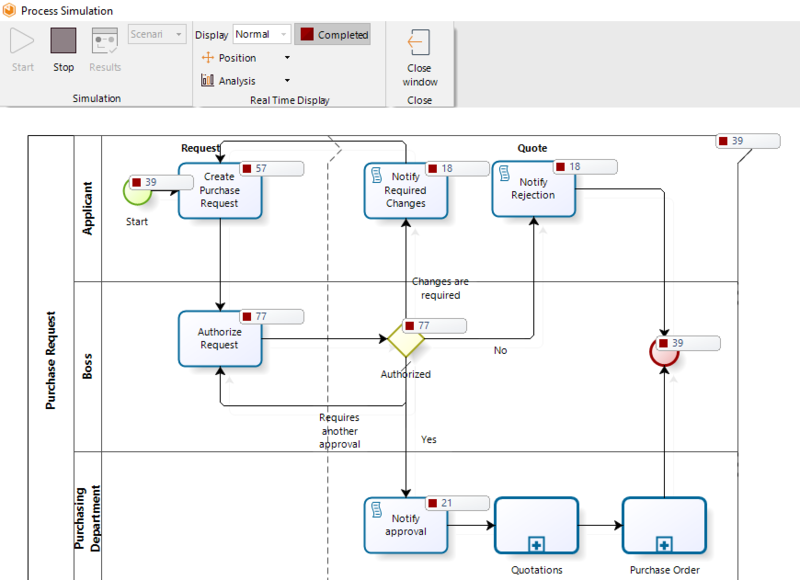 To simulate your process model, click the Simulation View button on the ribbon. If your diagram does not have any errors your process will display in read-only simulation mode. 2. The shapes that require information will be highlighted according to the simulation level in scope. 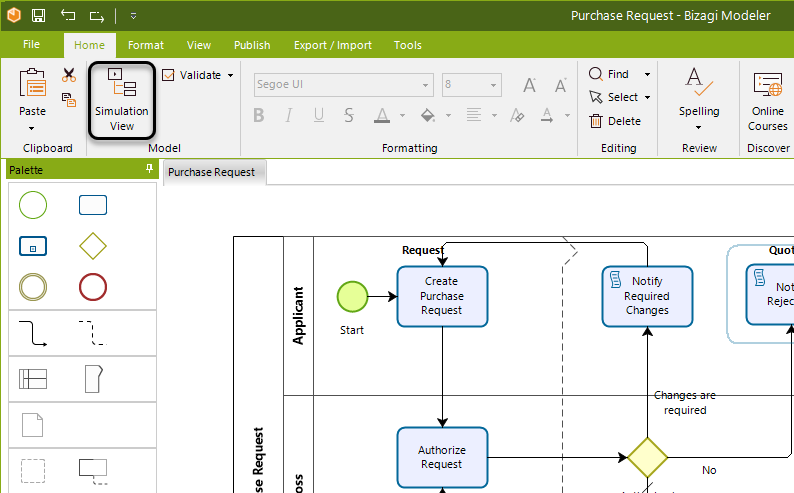 Note Bizagi will retain the level you are currently running once you save the model returning to the Process Model view. 3. Select each highlighted shape in turn and enter the information. 4. Once all the data has been added, click Run to launch the Process Simulation window. 5. Click Start to run the simulation. 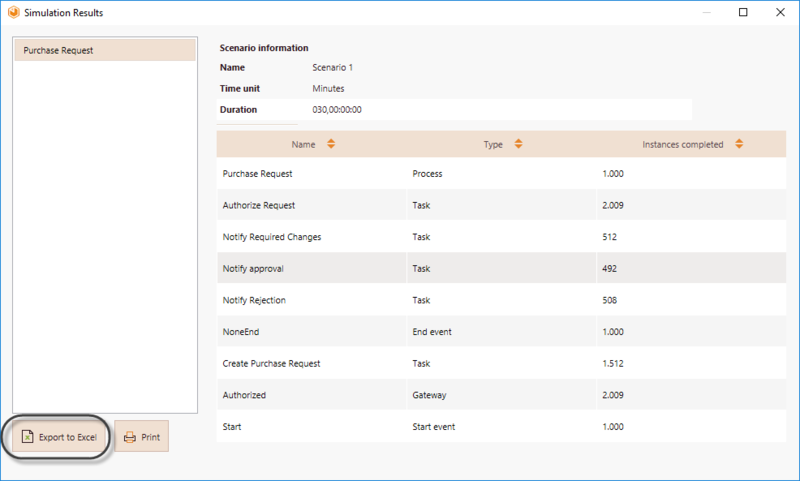 When you run a simulation, it will show an animated view of the process in execution and the flow of tokens between the activities. You may click the Stop button at any time to end the simulation. 6. Once the simulation has run, the outcomes will display. Click Results to view the outcomes. 7. Click the Export to Excel button, located at the bottom left, to transfer the Results chart to Excel. 8. Process to the next level of simulation and repeat step 2-8. 9. 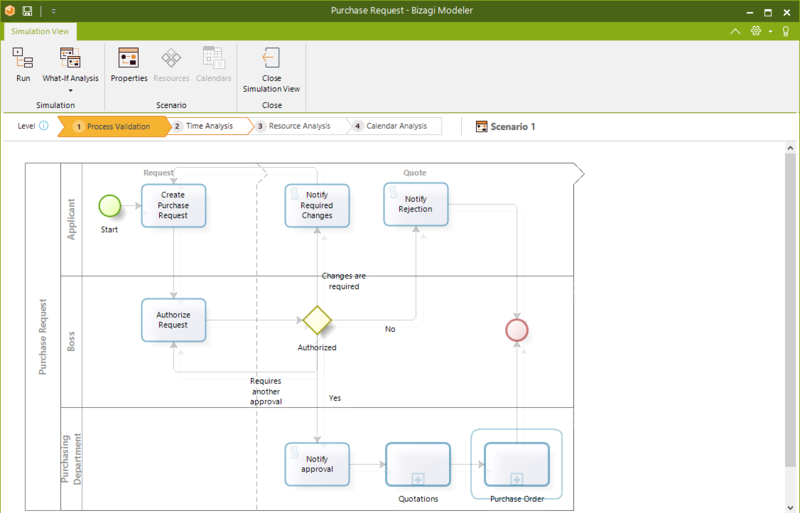 To return to the Process Model view, click Close Simulation View. 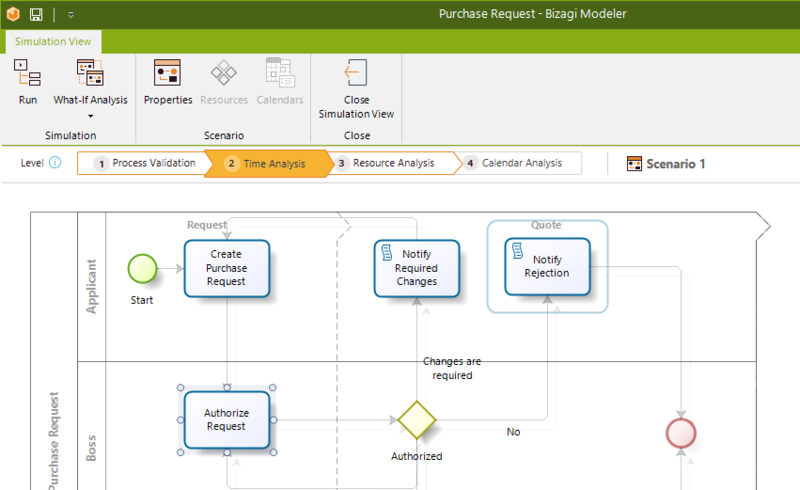 Save your model for Bizagi to retain the current simulation level, returning to the Process Model view. oMultiple events: Start, Intermediate and End. oEvent based gateways followed by none intermediate events or tasks. •Elements contained in Reusable Sub-Processes are not simulated. If you include a Reusable Sub-Process in your model you will have to set a overall processing time for the shape. If you want to simulate the logic included within a Sub-Process, use Embedded Sub-Processes. oMessage events require message flows to map tokens. Download an example. oLinks and Signal events are mapped based on their names. Make sure that throw and catch events share the same name.